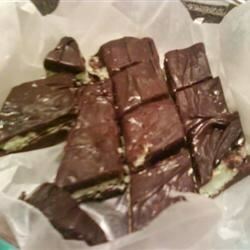 "If you like chocolate and mint together, and want something to satisfy your sweet tooth, this fudge will definitely do it! White confectioners' coating can be found in candy supply shops, or it is sometimes called Almond Bark." Line an 8 or 9 inch square pan with waxed paper. In heavy saucepan over low heat, melt chocolate chips with 1 cup sweetened condensed milk and vanilla. Spread half of the mixture into prepared pan; chill 10 minutes, or until firm. Reserve remaining chocolate mixture at room temperature. In another heavy saucepan over low heat, melt white confectioners' coating with remaining sweetened condensed milk (mixture will be thick.) Stir in peppermint extract and food coloring. Spread this mixture on chilled chocolate layer; chill 10 minutes, or until firm. Spread reserved chocolate mixture over the mint layer; chill 2 hours, or until firm.